I suppose that ends the matter in strict conformity with the regulations and interests of the service. I am sorry to find the fellow is not all that he ought to be, but probably he is a good riddance! 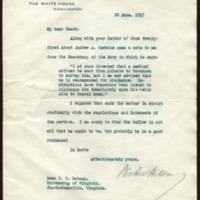 Wilson, Woodrow, 1856-1924, “Woodrow Wilson to Richard Heath Dabney,” 1917 June 22, WWP20524, University of Virginia Woodrow Wilson Letters, Woodrow Wilson Presidential Library & Museum, Staunton, Virginia.